I finally got some stamping time in today, so I decided to use it uber-efficiently and kill two challenges with one stone, so to speak! :) The Make it Monday challenge this week is "colored kissing", kiss-stamping a pattern onto a solid stamp to add a colored overlay. 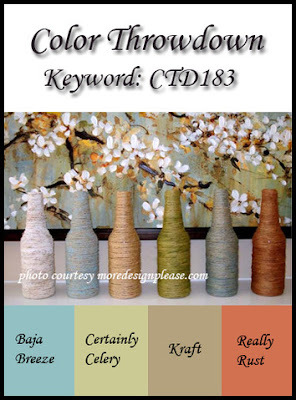 I'm also using the color scheme for Color Throwdown 183, which I translated into PTI colors as Spring Moss, Aqua Mist, Kraft and Canyon Clay. For the kissing technique, I added the small line pattern (in Aqua Mist) from A Little Argyle to a car (in Spring Moss) from Enjoy the Ride. I layered Mat Stack 3 and Layerz for the focal point, and used Think Big Favorites for the "celebrate". The edges are all inked up for a more rustic, masculine look. The Mat Stacks are popped up on dimensional adhesive, and I finished it all off with a Spring Moss button and some rustic twine. Here is a close-up to better see how the "kissed" pattern worked out. This is a wonderful card. I love that little car in argyle. I used this same set for my MIM, only gave him some polka dots. What a great technique...at first I thought you did paper piecing on the cute little car!!! Your card is adorable!!! Thanks for joining is for the Color Throwdown!!! Great card Debbie! Perfect stamp to kiss that little car with. Love the colour combo too. All-round gorgeous! So cute! Love the sweet polka dots and the fun VW!! What a sweet card! So glad you could play along with us at Color Throwdown!